Ice slurry technology is highly favored to maintain the freshness of fish, as the cooling capacity of ice slurry is higher than that of flaked ice, tubular ice, plate ice, and block ice. One important part of an ice-slurry system is the ice generator. A mechanical scraper is the easiest type of ice-slurry generator to fabricate, because mechanical scrapers use only one type of material, such as stainless steel. The purpose of this research was to develop a prototype ice-slurry generator and analyze its performance. To enable comparison of their performance, both the R-22 and R-290 refrigerants were used as the working fluids in the refrigeration system. The study observed the time necessary to form ice and the scraper’s ability to scrape the ice on the inner surface of the evaporator. The best system included faster ice-slurry generation and a durable generator that did not freeze up. Four combinations of scraper RPM and pump RPM varied speeds from low to high. The results showed that using R-290 refrigerant and lower RPM speeds for both the scraper and the pump generated ice slurry in a shorter time. 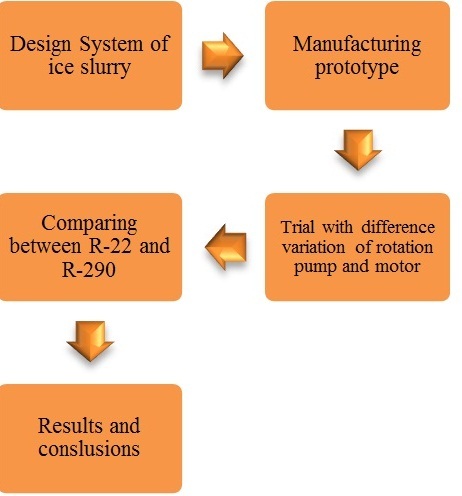 The present study investigated the performance of an ice-slurry generator having a mechanical scraper. The results showed that a higher scraper speed and a constant pump speed took longer to produce ice slurry than did a lower scraper speed but had the advantage of maintaining scraper performance without sudden cessations. In contrast, a higher pump speed and a constant scraper speed decreased the temperature of sea water more quickly. In addition, the results indicated that R-290 was a more efficient refrigerant than R-22, efficiently lowering the temperature of more sea water, enabling ice scraping, and avoiding generator freezing.